Here is a story that will tell you something about the quality of people we have in the Corvair movement. Just before Oshkosh, I was contacted by builder Rick Koch, who had been working part time on a Zenith 601XL project for several years. The complete airframe was done, but Rick, a veteran aviator of many years experience, came to the conclusion that he was busy enough with work and family, that he wasn’t making it out to the airport often enough to finish the plane any time soon. He called with a very generous idea: If I knew the ‘right person’, someone I was confident had the motivation to finish the plane, Rick would give it to them. After giving Rick some time to be sure of his decision, I told him I had his man: Tim Hanson. If you have not read this man’s name before, take a moment to read this story: 100 HP Corvair, Tim Hansen , Persistence Pays . I knew that Tim was the right guy, because life had already tested him, and it had never diminished his determination to be an aviator. People can start a project or a process with many ‘assets’ in their bank. The can be smart, educated, have financial resources, etc. but until they are tested, it is just speculation on how they will respond to the road getting rough. I have long said that Homebuilding is a continuous series of challenges. It is 1,000 chances to quit, that all come up when you are surrounded by people who tell you that everything you are doing is wrong and flying planes is foolish, building them is insane. To succeed, you must be the kind of person who shrugs this static off, and stays steady on the path. Tim Hansen is such a person. If you are getting the idea that Rick Koch is some sort of aging, super wealthy philanthropist, let me correct that. He is a hard working successful professional, but he is not Howard Hughes nor Warren Buffet. He is a regular American middle class guy in his fifties. I particularly like the idea that Rick didn’t need nor want to know anything about who the recipient would be, other than they needed to be determined. Rick has never met Tim, yet he was moved by Tim’s track record of persistence. To Rick’s perspective, all people are individuals, and to him it doesn’t matter what the claim, look like or where they come from, all that matters is how they act and the responsibility they take for those acts. If Rick is notably ‘wealthy’, it is in this sense: He holds a particularly strong sense of the value of individuals, and exercising his will, to make an effective contribution of his choosing, brings him the ‘wealth’ of living with fidelity to his own personal code. And that, to a man of character, is particularly valuable. Above, Rick running an engine outside my hangar several years ago. In discussing his gift, he mentioned that he has had countless hours of good times in aviation, from ultra lights to flying skydivers. Although he plans on returning to flying at some point, he chose to make his 601 project a ‘gift’ to a promising builder as an expression of how much flying has meant to him. Over the decades, Rick spent a ton of money in aviation…..but that was because he felt it was worth it. In the end, the money he could have gotten for the project would have hardly decreased his total spending in aviation, but conversely, making it a gift greatly increased what he personally got out of being an aviator. Mr Koch, Tim will make you proud of this generous donation you are making. 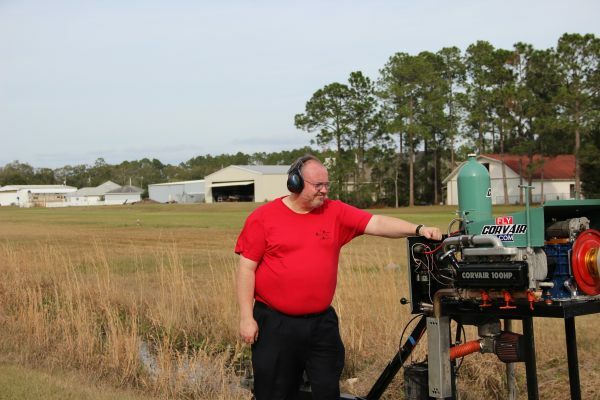 I was able to assist Tim a little last fall at Barnwell, while he worked on his engine. I enjoyed his company, patience and persistence all along the way. What a terrific story William. It is true that giving is better than receiving and this example illustrates it to the highest. Congratulations Tim and to Rick. I am so humbled by Mr Koch. Wonderful way to see your work live on and demonstration of being a part of another’s success! I am sure there are many, but this one story captures the character of FlyCorvair and is a paradigm for the Home Building movement to attain. That is AWESOME!!! Not often enough do good things happen to good people. Beautiful! Tears running down my face….